The ALA reports that 28% of US libraries now check out ereaders to their patrons, but hardly any are offering laptops. 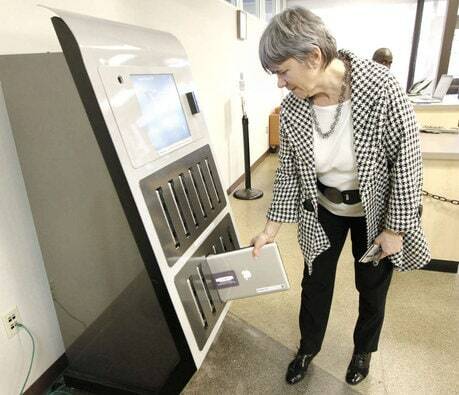 Drexel University is one of the first to offer loaner laptops to their students and they just installed a new rental kiosk to make the laptops available 24 hours a day. The kiosk was sold by Laptops Anytime, a Texas based firm that has for several years been offering a solution to the problem of desperately needing a laptop after midnight. This particular model was customized for Drexel before being installed in the Hagerty Library. It stores a dozen Macbooks in individual slots that offer charging, security against theft, and it even wipes any content left behind on a laptop by the last user. Students and staff can use their library card/university ID to check out one of the Macbooks, which they can use free for up to five hours. The kiosk was installed on 4 December during the last week of classes. As of Thursday, 11 January, the laptops had been borrowed 385 times with the greatest demand in the early afternoon. I don't know about you but this strikes me as a solution to a problem that isn't really a problem. These kiosks cost between $12,000 and 30 grand, depending on the options, plus the cost of the laptops. I have no problem with libraries providing computers for students (there was a time when I needed them) but I do think that is money better spent on installing more and better desktop computers. What's more, this kiosk was apparently inspired by one student was was afraid of taking his laptop to study in the library late at night. Omer Hashmi told the university's student newspaper that he was hesitant to carry his personal laptop to and from campus from his off-campus residence because it was both burdensome and posed a security risk. I'm not sure why it would be a burden to carry a laptop around, and if crime is really that much of a problem then this kiosk won't last long. Hey Nate, this is interesting – thanks for posting it. I live in Philly, and since I have something of an odd and unexplainable obsession with vending machines (as well as a very broad definition of what constitutes a vending machine! ), I’ll have to check this out in person sometime. I think I can shed some light on the Omer Hashmi subplot, by the way. Drexel is located in West Philly, and although it’s by no means in the worst part of West Philly, it definitely does get sketchy around there at night. It’s much, much safer than it was even 10-15 years ago, when Penn students were cautioned not to wander too far outside the confines of the campus. (Penn and Drexel are pretty much right next to each other.) Still, I’d bet good money on the fact that lots and lots of monied college kids have been robbed on the street over the past few years–especially after dark. Of course, that sort of crime doesn’t actually extend inside the campus buildings, due to security. I don’t think I’ve ever been inside a university library without either showing a university a I.D., or being a guest of a student. So I wouldn’t worry much about the laptops being stolen from the kiosk. By the way, I’m sorry we didn’t get a chance to meet up at Showstoppers. We must have been there at different times. It was great finally getting a chance to meet you in person, though. Thanks for the clarification, Dan. That does change things, but IMO if the crime rate is that bad then I would not attend that school. I skipped Showstoppers, sadly. A couple meetings ran late and then I was just too tired. I hear you on both counts, Nate. I can’t even imagine how beat you must have been at the end of the week after CES; I was only there for four days, and when I got home I was pretty much non-functional for 48 hours. It was a really good experience though – I actually can’t wait to do it again next year. It’s traditional to run yourself into the ground during your first CES. That’s how you know you did it right. And to be honest I’m still getting over it. Thanks Nate – that’s kind of you to say. And of course, I’m still kicking myself over all the great stuff I missed when I was checking out all the *other* great stuff at the same time. It’s weird that one of the things that makes CES so amazing (dozens of events going on at the same time, and the total impossibility of seeing even a tenth of it) is the same thing that makes it so frustrating! Drexel loaned laptops before they got this kiosk; I expect most academic libraries do, but I haven’t read that ALA report. My library has been loaning them for probably the last five years. And Drexel is probably getting this kiosk for the same reason my library is considering getting it; it’s a pain in the neck to be constantly checking out laptops and checking them back in. If you can automate that, then that is one less thing that staff have to deal with.